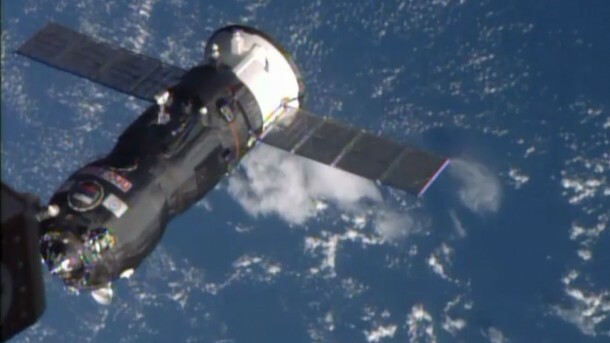 Traveling about 261 miles over the Atlantic Ocean, the unpiloted ISS Progress 57 Russian cargo ship docked at 9:08 a.m. EDT to the Pirs Docking Compartment of the International Space Station. The craft is delivering almost three tons of food, fuel and supplies, including 1,940 pounds of propellant; 48 pounds of oxygen; 57 pounds of air; 926 pounds of water; and 2,822 pounds of spare parts, supplies and experiment hardware for the six members of the Expedition 41 crew currently living and working in space. Progress 57 is scheduled to remain docked to Pirs for the next six months. The ISS Progress 57 is moments from docking to the Pirs Docking Compartment of the International Space Station.